"All the answers to your paediatrician's questions in the palm of your hand!" 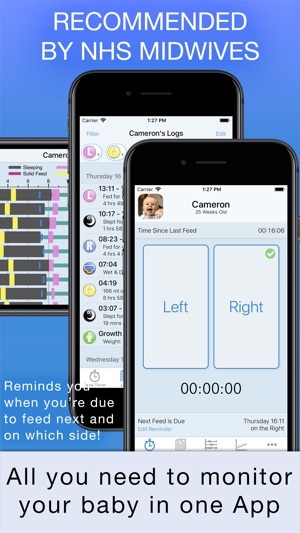 "Baby Feed Timer, an elegant app that makes tracking breastfeeding a cinch, with perks. The feed timer gives you 'left' and 'right' buttons (large buttons, thank goodness, so they’re easy to hit if you’re simultaneously cycling the baby through different feed positions). The best part? The 'analysis' screen." Designed by and for breastfeeding mothers who want to track when and for how long their baby feeds, including a useful reminder for when a feed is due. It even tells you which breast to start on! Baby Feed Timer does it all for you! Tracks breastfeeds, bottle feeds, breast pumps, diapers, sleep, solid food, baby's weight and baby's length. You can also make notes (ideal for recording baby's temperature and medicine given) and set notifications/alerts. 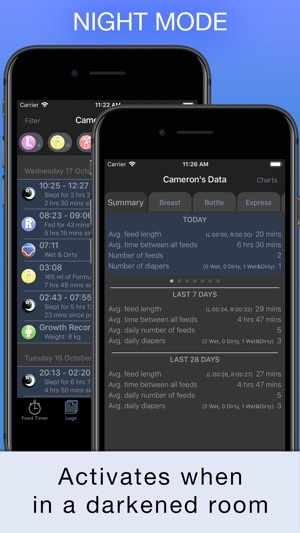 You can even synchronize the data across different phones (both iPhones and other phones) and view your data online at babyfeedtimer.net, making it easy to share baby's day with your partner or carer. Quickly log data about baby from your Apple Watch. You don't even need to get your phone out of your pocket! Data is analyzed ready for you and your paediatrician and shows daily, weekly and monthly averages. See baby's day at a glance and spot trends quickly with easy to read charts. 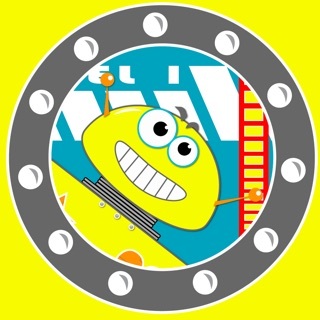 √ Personalise the App to your baby by adding a picture, baby’s name and date of birth. It even tells you how old your baby is in weeks. √ Use the App for more than one baby. Whether it’s a sibling later on or twins or more with full support for multiple timers! √ Easy to use one button start/stop timer, especially useful during the night feeds. √ Log breastfeeds, bottle feeds, breast pumps, diapers, sleep, solid food, baby's weight, baby's length, make notes and set reminders. 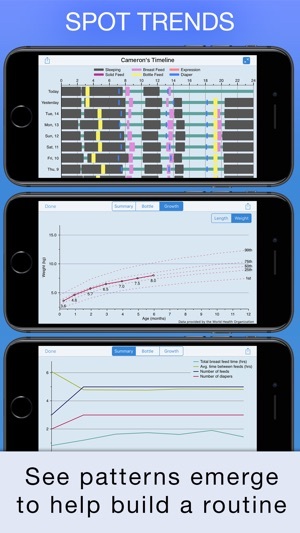 √ Synchronize data between different phones (iPhones and other phones). You can also view baby's data on babyfeedtimer.net. √ Apple Watch App. Quickly log breastfeeds, bottles, sleep, diapers, and breast pumps from your Apple Watch. Apple Watch also tells you when the next feed is due. It can even be used when your iPhone is switched off or not nearby! √ Night mode. The App detects light levels and automatically selects a night or daytime theme. √ Focus on what's important to you by selecting which activities you would like to be displayed. You can even customize it further to show them in the order of your choice. √ See baby's weight and length plotted against data from the World Health Organization to see what percentile your baby is in. √ Pause button. Ability to pause the timer during a feed. √ At a glance view of how long since baby last fed, next feed time and which breast to use next. √ Notifications to alert you when next feed is due, showing which breast to use. √ View when the next feed is due from your lock screen. √ Analysis of the data including average time between feeds and feed times for the day, week and month. √ Easy to read charts displaying analyzed data, as well as a timeline view so you can see emerging trends, such as baby feeding or sleeping at the same time every day. This also helps to show days when baby is acting differently such as more dirty diapers than usual. √ View how long you have fed your baby for that day. Particularly useful for mothers who are monitoring if baby is feeding enough. √ Manually add feeds if you miss one as well as edit feeds. 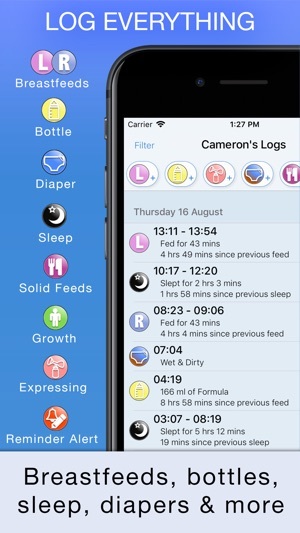 √ Add notes to existing logged feeds such as if baby was sick or fussy during a feed. You can also add a note to the log diary itself, for example, you can log baby's temperature and medicine given and optionally set a reminder for the next dose. √ You can choose if the next feed is calculated from a set interval or using current feeding trends. √ You can swap breasts during a single feed. √ The option to email your data to your computer. The Logs screen has been re-designed with the goal to allow quicker logging. You can now log everything with one tap instead of having to use the old popup menu. 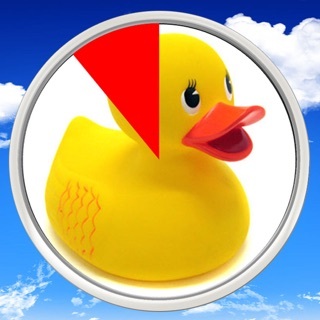 Great new icon to better symbolise what Baby Feed Timer is all about. The Timeline has proved to be a much loved part of Baby Feed Timer, it's a great way to spot trends. Because of how useful the Timeline is, we have now moved it to the main tab bar for quicker access. Feed and Sleep timer running notifications can be force touched to display the current feed or sleep time and can be stopped from the notification. Support has been added for the new Series 4 Apple WatchOS 5 faces, Infograph and Infograph Modular. 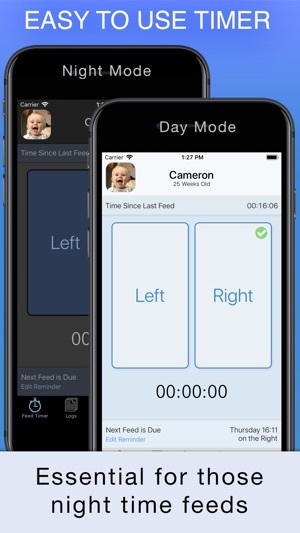 Baby Feed Timer from now on will be free to download on the App Store and will allow everyone a free 7 day trial. Tell All your firends they can now try Baby Feed Timer for free! If you see requests to purchase the full version simply visit the Upgrades screen to restore your original purchase. If I can get my Home Pod to start a timer, why can’t it start this timer? You’d think it would be a no-brainer to create a hands-free breastfeeding timer, but I’m guessing these things aren’t created by people who have actually nursed a baby. Particularly for those of us whose babies have poor latches, we need both hands to sort the kid, not faff about pushing buttons. Even with an Apple Watch, you still have to get your wrist in the right position and have a free hand to press go. So much for technology improving everyday life. It’s far easier to just watch the clock on the wall. Otherwise, the app is fair-to/middling. There is no way to input the amount of milk the baby is taking at the breast, for those who are weighing. The sleep function is pretty rudimentary; if you start the clock on one device you won’t know it on the other. My husband and I can’t coordinate very well as a result. The separate sleep timer isn’t much better, and why would you want to open a separate app for sleep anyway? The main benefit of this app is that you can choose what to track and eliminate the rest from your screen. The log filter is also helpful. All data can be entered or amended later, in case you don’t log something immediately, which is a plus. The analytics are really the only thing that make this better than a clock and a notebook. The machine saves time by doing the math for you. Otherwise it seems more like a toy than a tool. Just the app I needed!!! Love this app! At first I just wanted an app that easily tracked when I fed my baby and which breast - this app definitely met those needs and more! The app is very user friendly and I love the simplicity - nothing over the top or trying to do too much - it just does the job which is perfect! I love the reminder of which breast you last used and which breast is next - especially as a first time mom and being so exhausted that you can't even remember which breast you last used! The reminders are also very useful - especially with a sleepy jaundice baby that you need to wake up for feedings! I didn't think I would really need to track the poops and pees - but it's so useful to trend if baby is getting enough milk! The analysis feature also proved to be very useful! I just used the app to answer all my doctor's questions at the hospital - he was asking the trends of her feedings and poops/pees - this app made it so much easier to remember how many times I had fed her for the day and yesterday, wet/dirty diapers she had, average time between feedings, how long her feedings have been - the doctor was so impressed by the app! Gave him all the details he needed! UPDATE: some feedback that would be really helpful for me...would love to be able to have the analyze feature track night data vs day data, with ability to set custom time windows of what I consider daytime vs nighttime. And also would like to turn off analyzing averages for certain time periods...like i only express during work hours, but the averages are taking into account overnight... My son also only gets bottles during the day and I’d like to see how long he goes between feeds at daycare vs feeds at night time...same with naps during the day vs sleeping at night. If those features could someday be added, that would be amazing for working/pumping moms! !